Bubbling – Bubbling happens when the surface of an epoxy layer traps air. This can happen under two circumstances: 1) When the coating is exposed to direct sunlight and heats up, the air underneath expands and tries to escape, pushing the surface outwards and creating a bubble; and 2) When the coating is applied in a cool room and the temperature changes over time, trapped air will rise and create a bubble. Blistering – Blistering occurs when water and other liquids pass through the membrane created by the epoxy coating. When this happens, the moisture builds up beneath the coating and tries to evaporate. Garage floor epoxy is moisture-resistant, which means it prevents moisture from escaping, leading to a blister. Bad bonding – A successful epoxy flooring installation relies on the bond the material makes with the substrate underneath it. Improper floor preparation may be one of the reasons you see cracking, peeling, discoloration or other damage on your epoxy floor. These issues can make epoxy floors weaker and more susceptible to wear and tear than other flooring options. Epoxy floors may fail, but you can rest assured our polyaspartic floor coating systems won’t. 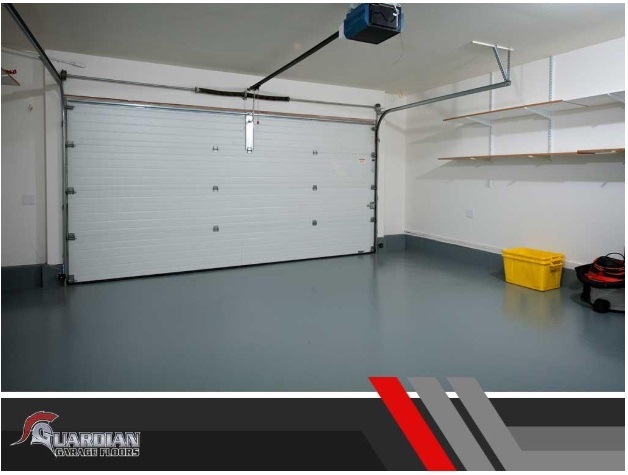 We’ve formulated our exclusive Guardian Garage Floors System with a stronger blend that withstands wear and tear and lasts much longer, so you won’t experience bubbling, blistering, bad bonding or other forms of damage on your garage floor coatings. (GA) to schedule a consultation! We serve Nashville and the surrounding communities. This entry was posted in Commercial Flooring, Home Improvement, Residential Flooring and tagged bad bonding, epoxy, garage.